Hello my name is Ryan Gibson. 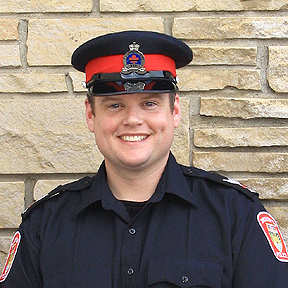 I am currently the Commanding Officer of the Thunder Bay Police Youth Corps. I would like to take this opportunity to thank you for visiting our website.The Thunder Bay Police Youth Corps is a non-profit group and we are supported by the Thunder Bay Police Service, Thunder Bay Police Association, Loyal Order of the Moose Lodge 947, Rotary International, NOSA and Pizza Hut. Lead by example is the motto that guides the Thunder Bay Police Youth Corps. Our youth learn to lead by example by broadening their knowledge and self-discipline through fun educational activities. Cadets are involved in the community by volunteering their time to a variety of events. Our goal is to increase our cadets' confidence, and to help make them exemplary citizens out in the community. If these types of ideals appeal to you I encourage you to come out and give our organization a try. We recruit in September with an Open House and advertise in the fall issue of the Key each year.